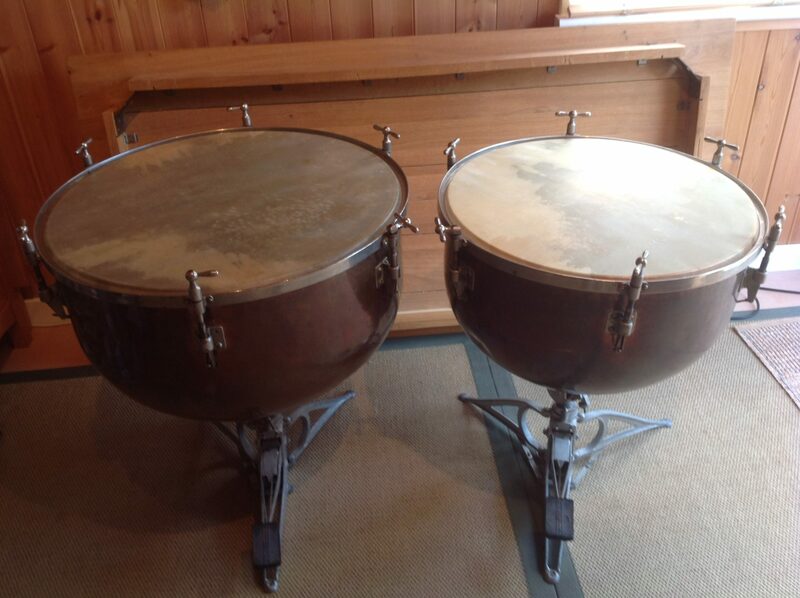 Here is a pair of very old timpani that a customer wants to sell due to retirement. 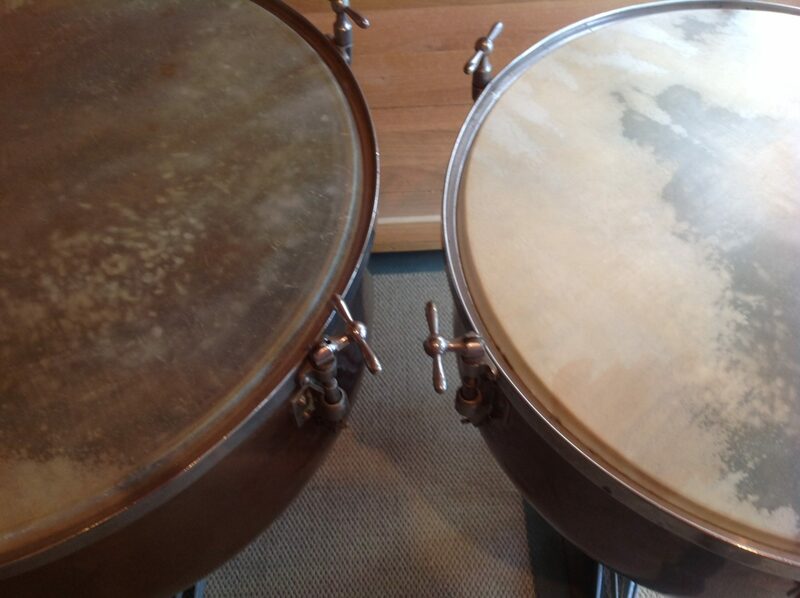 They have had two owners from new and these drums are rare. There are a few scratches in the bowls but no big dents, and there are a couple of T handles that need to be replaced, but I may well have some of these buried in a box of vintage spares. There is also a tie bar missing to one of the legs, but to be honest this is much easier to make than to find an original replacement. Neither of these issues poses a massive problem for me because the costs of correcting them would be a fraction of the instrument value. As can be seen they have calf skin heads on for which the drums were designed to be used. In reality it will probably be problematical finding easily available plastic heads – any size can be made, but you will have to wait for at least three months and expect to pay at least three times the price of standard heads. But who wants plastic over calfskin anyway now? As with all of the second hand instruments I sell, I handle all the negotiations because my customers are selling through me for precisely that reason. 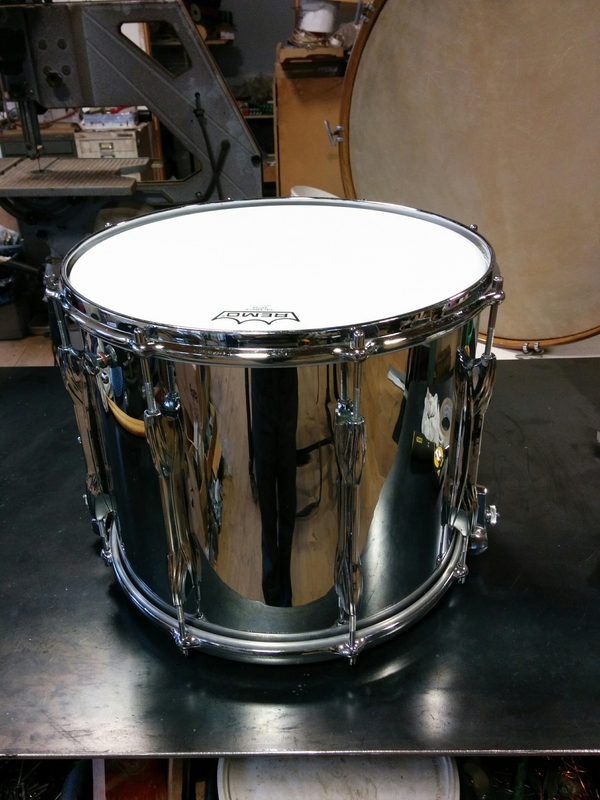 The drums are currently at the owners house in southern England, but I will collect the drums for viewing when there is a serious buyer. 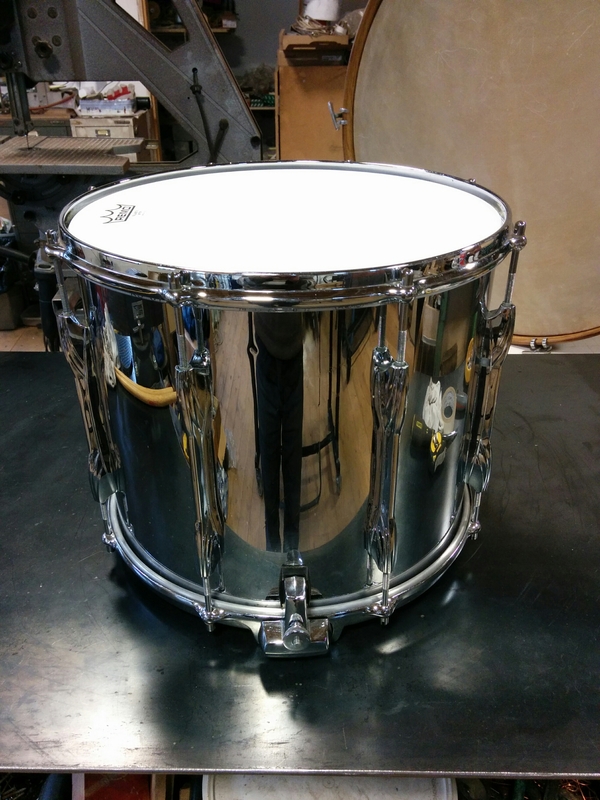 By 1927 Premier Drums had introduced the De luxe Model Tympani. 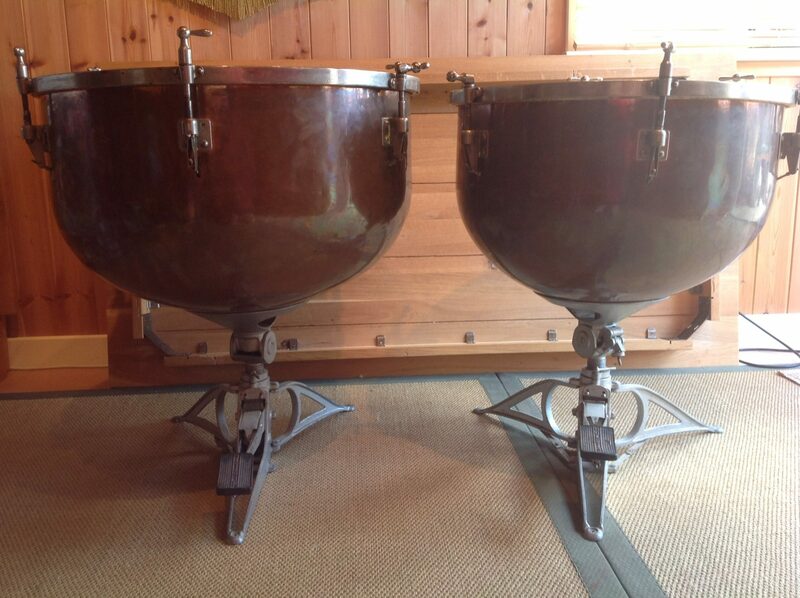 These were still “classical timpani” so had retractable legs on the basic pot, but these were the drums that saw the development of the bowl shape and the fittings. 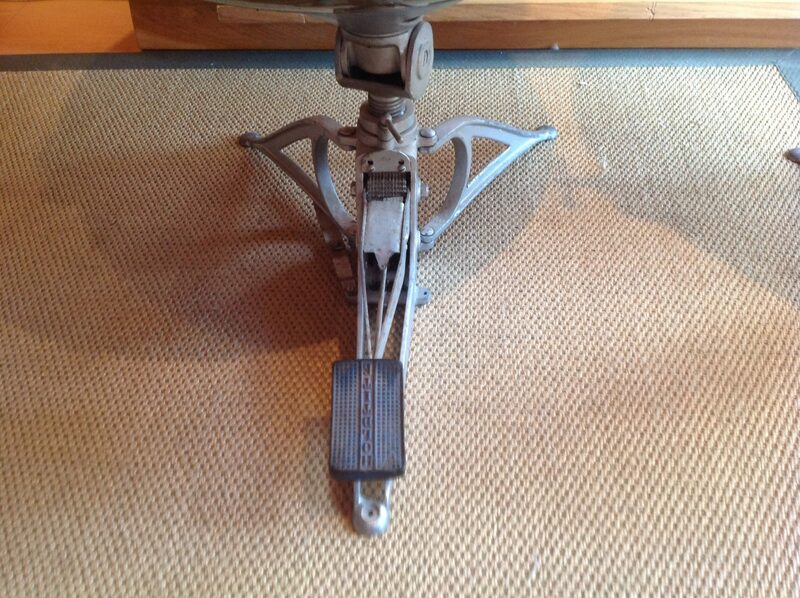 For instance by 1928 the drop handle was introduced on these drums and self aligning lugs. Also in by 1298 Premier had developed the pedal mechanism. 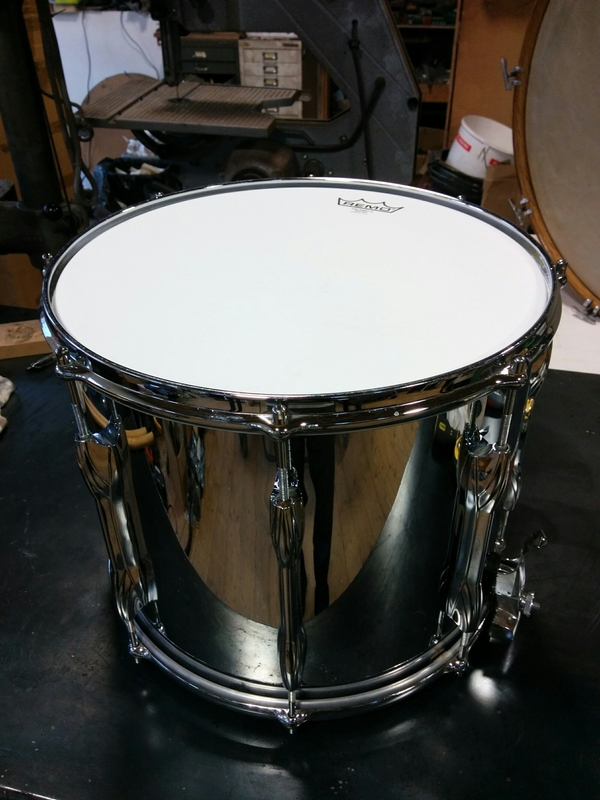 It is the obvious choice to put their best bowls onto their newest flagship product and called them the inspirational name, “Pedal Tympani”. 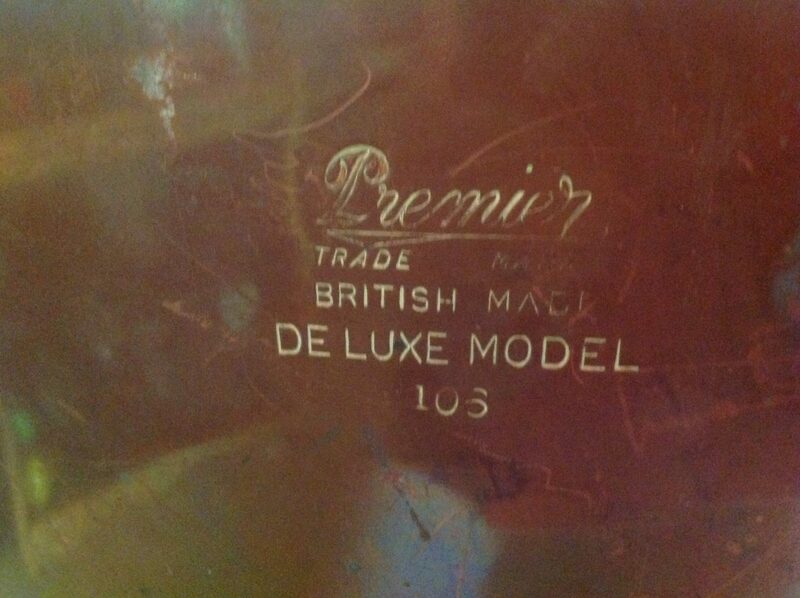 It is interesting reading the catalogue description where it mentions the Premier guarantee; I have no idea what that was, but the fact that these drums are still working and sounding great nearly a hundred years later is a testament that British engineering was and will always be the best in the world. 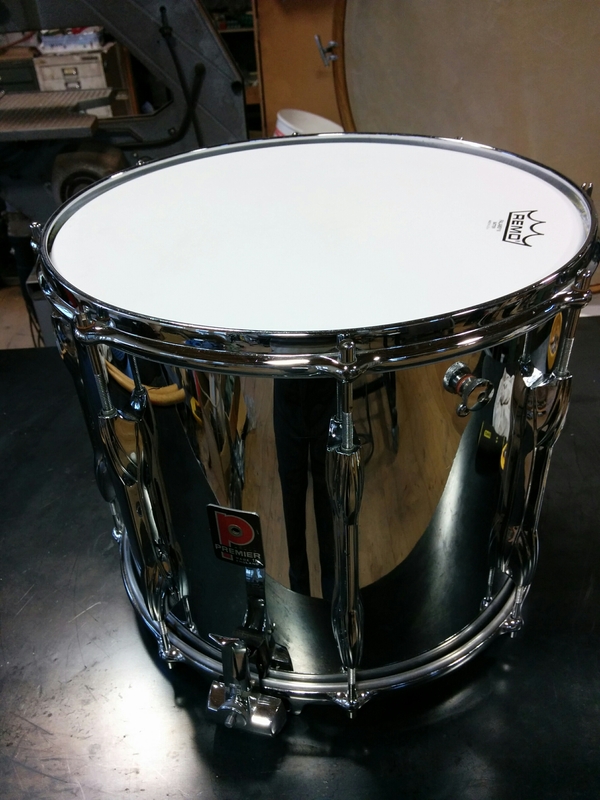 The last time these drums were seen in the Premier catalogue was in 1951. They were almost a footnote on the same page as dampers, badges and drum keys! I think that this is more a reflection of post war austerity than anything else, but it was the end of the run because in 1966 West Ham United won the football world cup (I mean England) and Premier launched the Series One Timpani – out with tymps and in with timps! As well as the marimba I also have a Kelon xylophone for sale. Again this is on a field frame, which is even more disproportionate than the marimba considering how light xylophones are. The frame was also damaged so speak to me directly about the options for replacement. This instrument would be perfect for a school or college (or marching) and put on a fixed frame with no nuts and bolts to ever come loose. The note bars are in good condition. These are the Kelon bars which are a type of glass fibre and so are impervious to atmospheric conditions which makes them perfect for outside use. Like on the marimba they sound OK, but because they are synthetic they completely lack the timbral quality of wooden note bars. However, as I have said I am picky when it comes to sound quality and know what I like and that is wood. Additionally, Musser, like most of the manufacturers fail to make the bars thick enough, which means that, for me, the notes are too resonant. 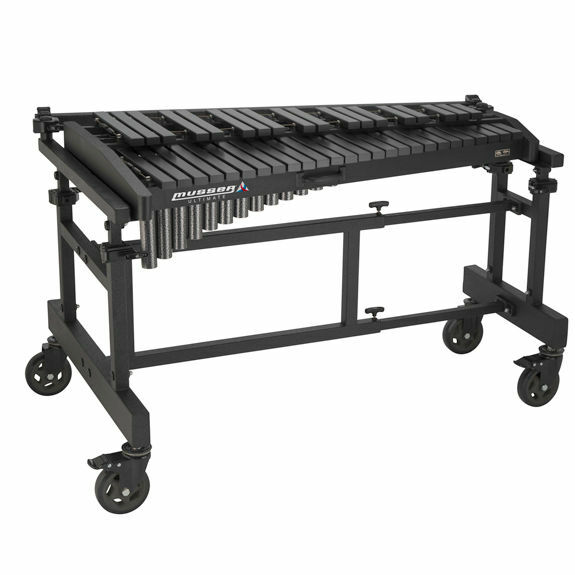 All that said, just like the marimba, I was actually pleasantly surprised that the bars sounded the way they do – my expectation was low and that I would hate the sound and actually they sound okay. 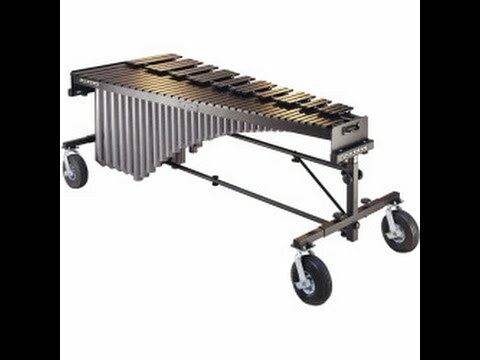 I have a Musser Kelon 5 octave marimba in my workshop for sale. I also must confess it has been in for a while – it is always good to ask if I have anything for sale because I generally do! The delays are generally having the time for me to sit down and write this blurb, clean, repair and set up the instrument for photo’s and video. Because 5 Octave marimbas are massive, they take up a huge amount of floor space which means that the workshop needs to be pretty empty in order to do that, and that never happens. So because the instrument has been hanging around for a while I decided to write this blurb and will upload the photo’s and video later. Anyway, this instrument is on one of those massive field frames pictured above and consequently is built for the US market where they like things to be ridiculously heavy and ironically not very strong! My advice would be to ask me to replace the frame with something made a lot more transportable and usable. The frame is functional, but not very user friendly; spanners are needed to assemble it and this in itself suggests that it is meant to be transported whole which means that you would also need to buy a long wheel base van! My frames are bespoke, so we can discuss your requirements and I will advise accordingly. The note bars are in good condition. These are the Kelon bars which are a type of glass fibre which makes them impervious to atmospheric conditions which makes them perfect for outside use. They sound OK, but because they are synthetic they completely lack the timbral quality of wooden note bars. However I am a bit picky when it comes to sound quality and know what I like and that is wood, but I am pleasantly surprised that the bars sound the way they do – my expectation was that I would hate the sound and actually it’s on the okay to nice scale (if that makes sense). Because it is a marimba, the resonators are massive too! these are the wide ones which amplify the fundamental and give a really rich tone. For me, it is these resonators that is the reason for buying, everything else can be easily upgraded at a later date, but making resonators like these would be very involved which means very expensive. So they sound great, but they are big, and big things are heavy. It’s the general theme of this advert.